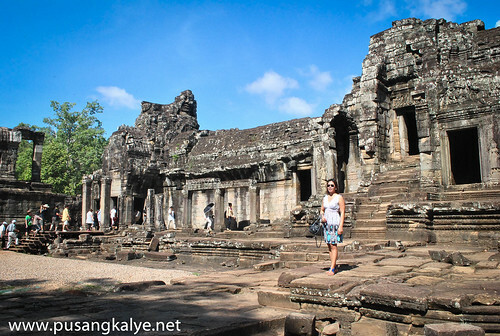 I really find Angkor Wat photogenic in every angle (especially because we were there in the early morning) not to mention that being inside it,you feel how strong the structure is. 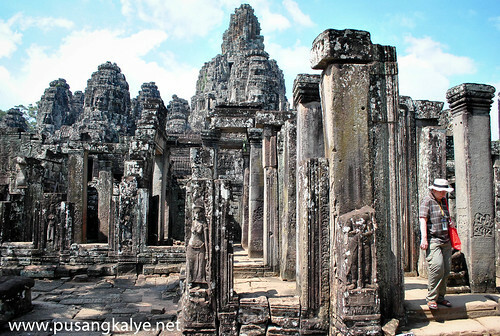 BAYON TEMPLE on the other hand has a different appeal.From afar,you would find it a bit hard to make sense of what it is except for the impression that it is a giant structure of piled rocks.As you get closer though, the more you appreciate the intricate design and mysticism of the place. 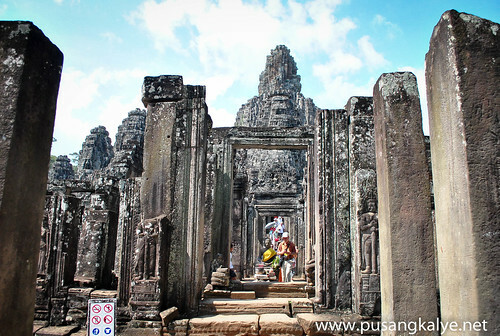 The guides usually know where to take you even if you are just hiring a tuktuk.I didn't research much on Angkor Complex prior to going here.It was more of an "I want to surprise myself" mode for me. 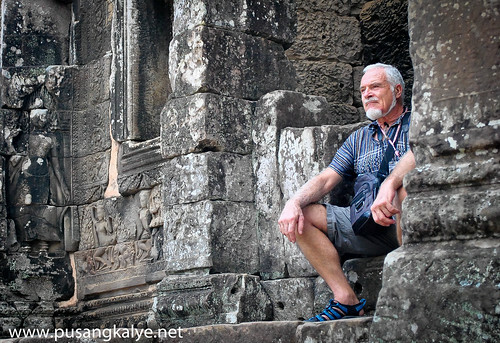 But we were lucky with our tuktuk driver who took good care of us. 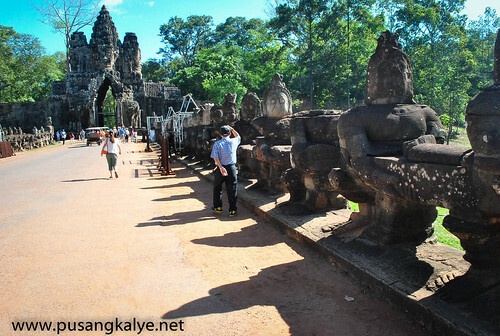 He drove us to Angkor Thom via South Gate where Buddha statues line up the the bridge to the main gate.Unlike in other gates where Buddha statues have long gone. 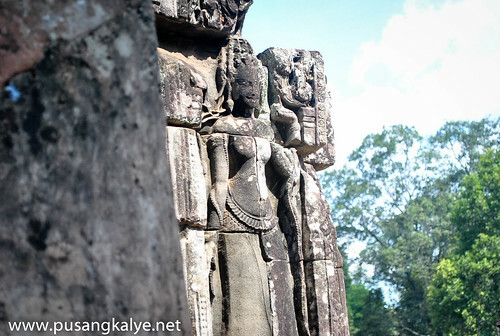 At Angkor Thom, gate palang , jaw-drop moments na. 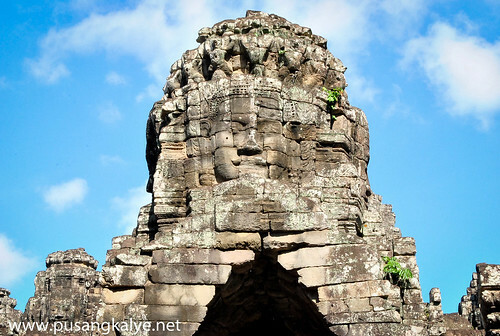 The gate itself is 23 meters high,composed of three towers and has four faces.I noticed that the opening could only accommodate one vehicle at a time as it is too narrow. 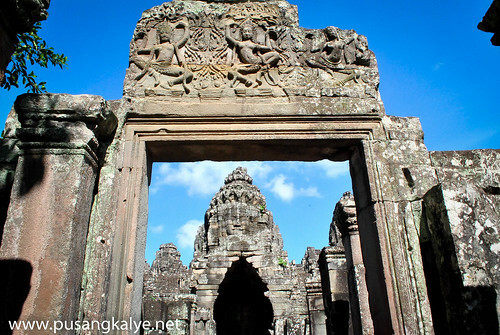 My friends and I were of course wowed.Talk about 'Grand Entrance' again.And the gate sets a thematic mood of Angkor Thom culminating in the grandest structure in the city ---BAYON TEMPLE. 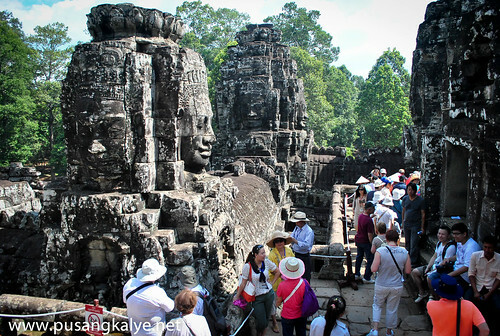 Although we could go past the gate via our hired transport, our driver dropped us by the gate and directed us to walk and meet him on the other side.I thought it was some sort of SOP but he simply wanted us to appreciate the gate of Angkor Thom and walk through the approach with the statues of gods and asuras (devils) lining it.Actually,all five gates to the city are similar but the South Gate is the most extensively restored and therefore complete. There are shops nearby the South Gate where one can purchase items such as articles of clothing,accessories,books and other house decors. This is also where one can hire for an elephant ride for $20/hour. 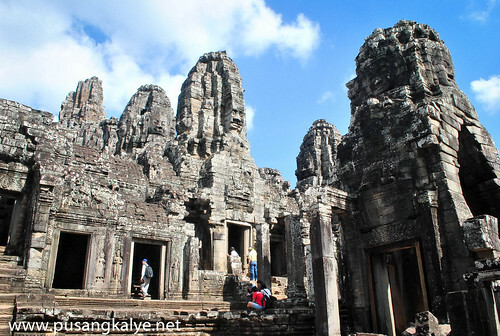 Bayon Temple is very distinct among the temples of Angkor Complex because of its "face towers". 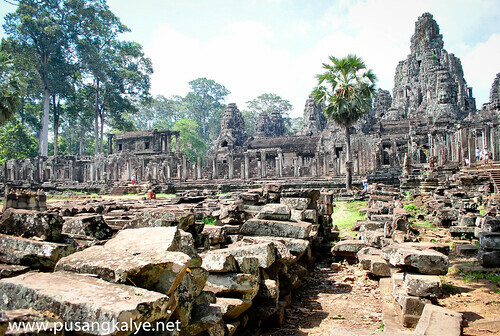 You can hardly make sense of it from afar but the closer you get to Bayon, the faster your heart beats.It's mysterious.From a total of 49 original face towers, 39 are still standing today.Most towers are carved with four faces facing the four cardinal directions. The faces are all the same.I originally thought they are those of Buddha but looking closer,you would realize they are not.It was a mystery for a long time whose face it was but the most accepted explanation now is that they are that of Jayavarman VII.This temple after all was his State Temple as well as his immediate successors.The faces looking at four cardinals points represent the kings grip on the kingdom which reaches far from the city (Angkor Thom). 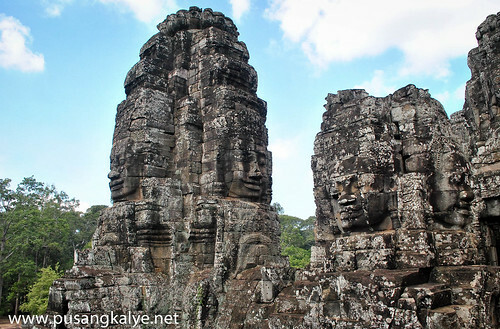 THE BAYON could be best described as a mass of face towers creating a stone mountain of ascending peaks.You can appreciate these face towers once you get to the third level.There,you can a close encounter as you walk around. 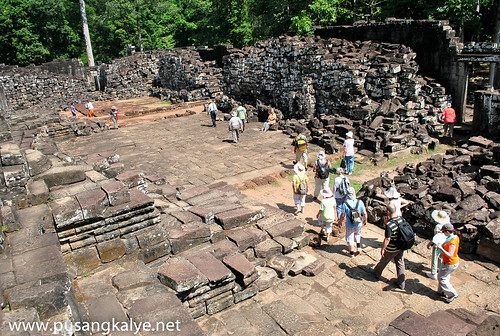 We went straight up from the ground floor to the third level excited to see the face towers and therefore missing the enclosures ----narrow chambers and corridors with stone carvings on the walls ---telling stories of historical events like the battle against the Chams (Vietnamese) or scenes of daily life.I noticed some of them while on our way out of the East section of the temple. 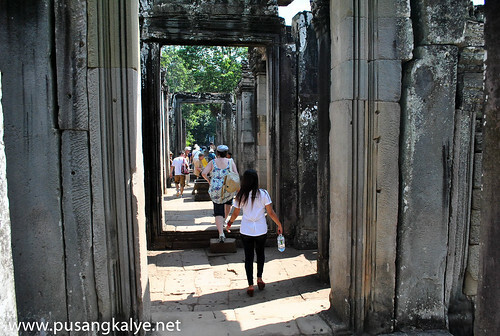 We came here at around 10am and the crowd was as expected already too thick.If you are thinking of having a photo with only the stone faces, forget about it.It is difficult to compete for space actually,that includes space when walking up and down stairs. 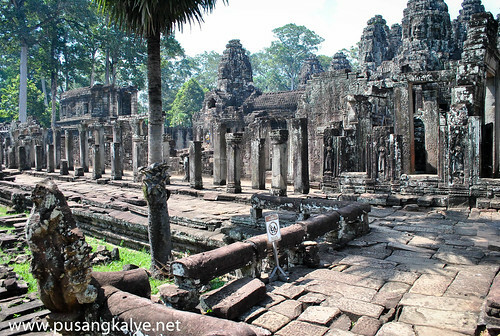 Restoration is ongoing as many sections of Bayon are already ruined.This temple though is proof that there is beauty in chaos.I honestly think the temple looks fragile in contrast to Angkor Wat which is very solid.Both have a different appeal but as I said, on photographs,Angkor Wat will be the darling but in person,Bayon would win the heart of most visitors.A pile of rubble from afar, but a beauty up close.No wonder why it's one of the most loved temples in Angkor Complex. 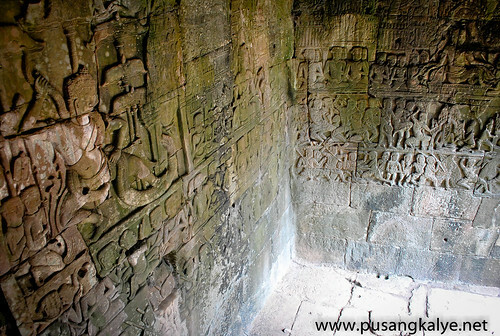 I would suggest you exit the East door.And if you have time, try to look for the carvings on the walls of the east Section.The from of the temple facing east is the photogenic section as well. 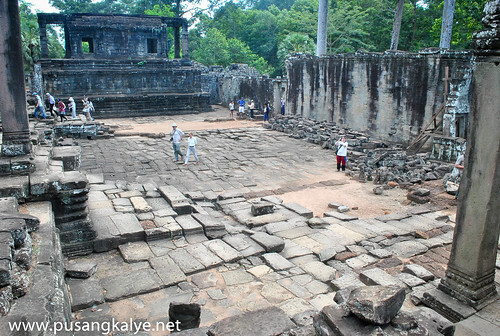 This is where I took the header photo on this post.It happens to be the section leading to other temples within Angkor Thom ---notably Bapuon ---which is something you should not miss.It's only a few hundred yards from Bayon. Single day pass is $20 per pax. 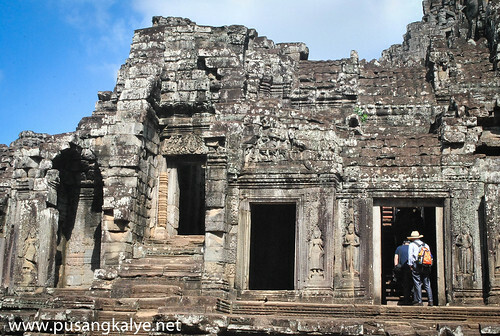 By the time we were in Bayon, I realized that 1-day is definitely not enough to see everything in Angkor Complex.Some books say that three days is the ideal time for beginners.At least two hours is recommended of a visit to Bayon but we finished after 45 minutes due to time constraint.I think I should go back for a deeper appreciation of the place. 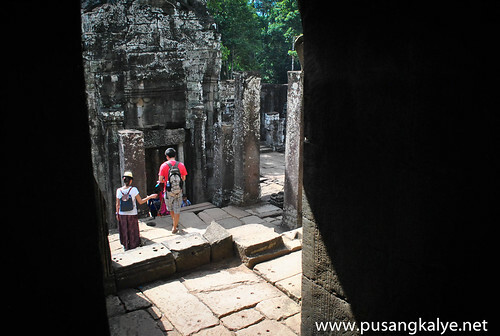 This was part of our Day Tour of Angkor Complex which lasted from 5am-2pm. gnda ng mga shots at very relaxing un ligar.